http://flevy.com/blog/wp-content/uploads/2018/12/chessboard-glass-768x510.jpeg 768w, http://flevy.com/blog/wp-content/uploads/2018/12/chessboard-glass-1024x681.jpeg 1024w" sizes="(max-width: 300px) 100vw, 300px">One of the major necessities of this information age involves developing leadership that is capable of guiding organizations through challenging times. A vast majority of executives at most organizations are exceptional in handling routine operations; however, finding leaders proficient in transforming the ways of doing business and tackling unique problems is not easy. The paucity of leaders in-house triggers hiring of external talent, which does not help in transformation, as successful change dictates leading from within. This scarcity of leaders often goes under the radar, which further aggravates the situation, as it is difficult to distinguish strategic inadequacies in an organization’s senior leadership. It comes to light only in case of a major setback when the organization realizes the inadequacies of the current leadership. Strategic leadership capabilities can be developed, but this merits revamping the management, cultural, employee development, and promotion practices. 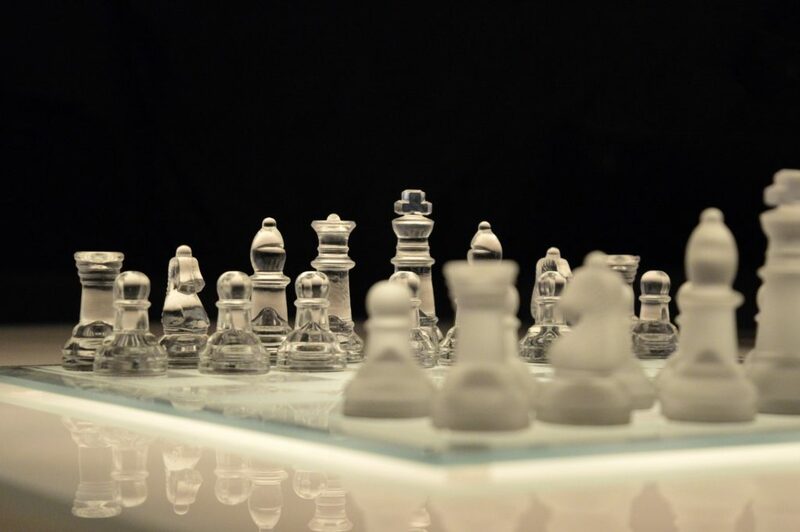 The 10 Principles to Strategic Leadership involve a combination of organizational systems and individual capabilities that when implemented collectively facilitate in attracting, developing, and retaining strategic leaders. The 10 Principles of Strategic Leadership fall under 3 distinct groups. The first group includes approaches to decision making, transparency, and innovation. The second group encompasses unconventional ways of thinking about assessments, hiring, and training. The last group comprises of principles designed for the potential strategic leaders themselves. Now, let’s take a deeper dive into the first 3 principles of Strategic Leadership related to Systems and Structures. Strategic leadership capability can be built through practice and a bit of authority. It is important for the top management to delegate authority and empower employees across the organization to take risks and make decisions. Often, there are people in the lower ranks that are of immense help in finding viable solutions to intricate problems, if only they are given the opportunity to shine by delegating responsibility and showing confidence in them. Transparency and organized sharing of information is critical for inculcating strategic leadership. The traditional management structure has been derived from the military, which intrinsically limits the flow of information and makes it available to certain people only when needed. This limited flow of information leaves the executives to make decisions without sufficient data—relying on conjecture only—and precludes them from sharing creative ideas that clash with that of their superiors. At traditional organizations, managers decide the fate of any new idea by their teams—appreciating its value or suppressing it from being analyzed. Suppressing the idea also quashes the innovator’s excitement. The ability to generate and share creative ideas is essential for strategic leaders. Organizations need to encourage innovation by allowing employees to email the leadership directly and by holding weekly meetings for employees of all ranks to approach leaders openly. 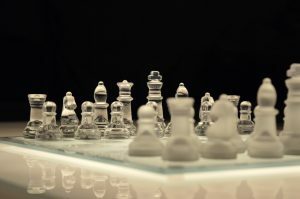 Interested in knowing more about the principles of strategic leadership and the essential traits of strategists? 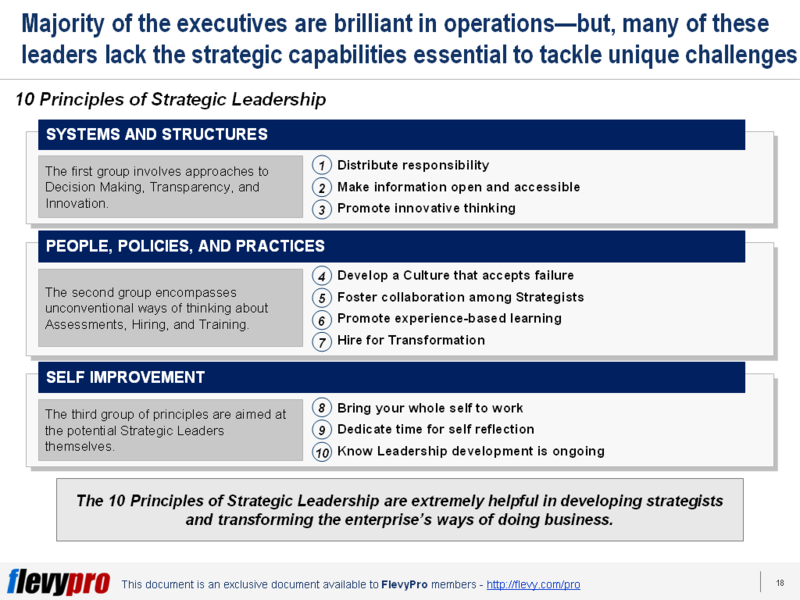 You can learn more and download an editable PowerPoint on the 10 Principles of Strategic Leadership here on the Flevy documents marketplace.